A doughboy detective hunting for hidden Nazi gold solves a murder puzzle in the process. Using the Rhône River as a landmark, Capt. Billy Boyle (Blue Madonna, 2016, etc.) and his sidekick, Piotr "Kaz" Kazimierz, make an emergency landing in occupied France after their plane is hit by enemy fire. With German troops nearby, they make a run for it toward Switzerland. They’re rescued by Anton Lasho, a Sinti who, after suffering the loss of his entire family at the hands of the occupiers, has become a one-man resistance, killing Nazis left and right. The pair find refuge in an abbey, where they learn the details of Lasho’s sad history. Their contact in Switzerland, bristly Maureen Conaty, is openly disdainful of Lasho, whom she deems a distraction for the resistance, but Billy and Kaz effectively advocate for him. With fake credentials, they hunker down in Switzerland to search of the Nazi gold that’s laundered there, a sum likely in the hundreds of millions. In Bern, where a direct delivery from the German Reichsbank is expected soon, an international collection of Allies assembles to assist them. Victor Hyde from the American Embassy and his good friend Henri Moret join Billy and Kaz to watch the convoy of Mercedes Benz trucks parade by, with Lasho and Conaty not far away. But before an effective heist can be implemented, one of these four new colleagues is murdered. 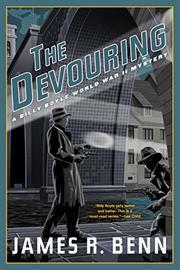 Benn’s 12th World War II mystery keeps the action coming, with a nifty whodunit chaser.